Leonard Harbaugh Jr. was born on Sept. 28, 1824 near Rockwood, Somerset County, PA, the son of Leonard and Martha (Minerd) Imel Harbaugh Sr. Disabled by a timber-cutting injury in his 30s, he nonetheless was active in his community and served in a judge-like capacity, renowned for his fairness. Leonard had dark hair and hazel eyes. A shoemaker by training, he moved as a young man to nearby Fayette County, PA. In 1848, when he was 24, Leonard married 17-year-old Maria Elizabeth Eicher (1830-1899), of Normalville, Fayette County, the daughter of Joseph and Rosan (Kern) Eicher. Their only natural-born son was Allen Edward Harbaugh, the "Mountain Poet" of Mill Run, famous as a sign and portrait painter, journalist, poet and historian. As a young man, Leonard served as an orderly sergeant in the local Springfield Blues volunteer company, and "was a splendid type of soldier and physical manhood." But tragically, in 1860, he became "hopelessly crippled" when he was bent over double and his legs were crushed when a large tree he had cut down rolled over on him. His son referred to him as "a wreck of humanity in the prime of manhood." All told, he was much fortunate than his uncle Jacob Minerd Jr., who had been killed while cutting down a tree 18 years earlier, in 1842. Leonard and Maria also adopted an orphaned boy, Samuel Martin, the son of Mary Martin. They renamed him Ulysses Grant Harbaugh. In the official adoption papers, dated 1875, Leonard said the boy's father "is supposed to have been killed in the army, according to the statements of the mother, who gave said child to [me] when quite young. 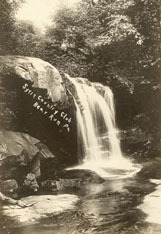 [I have] supported said child in [my] own family for some nine years past, and [am] desirous of adopting him as his own and as an heir..."
The spectacular waterfall at Bear Run, just a few miles from Leonard and Maria's home, was a local landmark with which they would have been very familiar. In the 1930s, the world's most famous modern house -- Fallingwater -- was built atop the falls. ...natural genius and executive abilities. She was not only good at constructing but was an expert tailoress, and at needlework she had few superiors in the deft art before the advent of sewing machines. She was self reliant and in business diligent and prudent. ...Active and courageous, with quick perception, having knowledge of men, matters and business; he was a leader in all good works, secular and religious; for 50 years a member of the church of the United Brethren in Christ; was a promoted in building of the churches at [Normalville] and Mill Run, served as a trustee at times in both; he was a great worker in Sunday schools, he being a great lover of children. He was strongly a temperance man and worked for the local option law.... Having been a Democrat up to this time, he remained loyal to the Union and supported Lincoln in 1864 after his support of Douglass in 1860. He was an inveterate reader of history, law and current events, and was sought for his counsel in matters at law, he being always successful as an agent or arbitrator. Fluent of speech, he was a logical reasoner and had a fine taste for the dramatic. An accomplished author, Leonard often had letters printed in the Courier. He frequently gave speeches at community events and taught an institute for teachers in March 1873, as noted in an article in the Uniontown (PA) Genius of Liberty. Knowing that his grandfather, Casper Harbaugh, had been a wagoner during the French and Indian War, and escaped from the disastrous "Braddock's Defeat" near what would become Pittsburgh, Leonard maintained an interest in the history of the region. An 1885 Uniontown news article said he possessed a French & Indian War relic, "a one-ounce, cast iron musket ball dug up by workmen at Braddocks Field, near the historic ravine where many English grenadiers lost their lives in the famous fight between Braddock and the French and Indians. It was sent to Mr. Harbaugh by a Braddock editor, but with no warlike intention, however." One of Leonard's cousins later would be caretaker of Braddock's Grave in nearby Chalk Hill, Fayette County. Leonard also was a voracious reader of newspapers well into his 70s. Son Allen once wrote in the Somerset Leader that Leonard "is past 70 years of age, with a retentive memory of events in his boyhood days, and the traditions of early times, which have escaped the historian's pen." For two decades years after his accident, Leonard suffered greatly from his lingering injuries. He was able to walk, but only with help. Nonetheless, wrote his son in the Uniontown Genius of Liberty, "Almost every citizen of Fayette county knows Leonard Harbaugh, the crippled man, ... and many people in Uniontown ..." To alleviate his physical pain, he "used with but little benefit almost all the patent nostrums of the age." However, by 1881, he had found some relief using 'German Magnetic Liniment' invented by a "German by the name of Albert Nacke, M.D., a graduate from a German university..." The ointment "afforded him the greatest relief from suffering of anything yet tried, and so confident is Mr. Harbaugh of the intrinsic merits of the Liniment, that he has taken an agency for the sale of the medicine. For rheumatism or neuralgia it is a certain palliative." Leonard also was able to maintain a garden at his village home. In late September 1881, Connellsville's Keystone Courier said that "Farmers are beginning to cut their corn which is very poor, Leonard Harbaugh's being the most bountiful of the community." The Harbaughs suffered the heartbreak of tragedy in August of 1888 when 23-year-old son Grant, who was betrothed to be married, died of typhoid fever. Family friend Andrew J. Colborn, writing a moving eulogy in the Genius of Liberty, said "The staff which aided the tottering steps of his foster parents is removed." Leonard died on Sept. 11, 1896 at Mill Run, as he approached his 72nd birthday. Former justice of the peace Kern conducted devotional services at the family home, and after burial, another funeral service was preached by Rev. Zook. The Genius eulogized Leonard as "an aged and highly respected citizen..."
Maria outlived him by three years, and suffered a stroke on May 15, 1899. After three months of decline, she died on Aug. 19, 1899, and was said to have "passed through the refining fire of affliction and sore trials without murmur or complaint as to the dealings of the Lord." They are buried together in unmarked graves beside the marked grave of son Grant at the Indian Creek Baptist Church in Mill Run.